Now found all over the planet, bullfrogs are ravenous eaters and will eat anything they can swallow. They can rapidly eliminate populations of native small animals including snakes, fish, rodents, insects, amphibians and birds. Ever multiplying, their reproductive capacity is astonishing; an adult can lay 20,000 eggs in a single clutch! Luckily, bullfrogs have tasty legs and you can prepare them a number of ways. As tradition has it, bullfrog hunters do not wear waders. It’s rather a primitive exercise to head out after dark (preferably under a full moon), sink into the pond with not much more than a torchlight and gig – a ten foot pole with a multi-prong spear tip; but one that is entirely authentic. You lurk around the dark water until you see that defining ‘eye shine’ that means, at least for a moment, the frog is frozen in the bright light. You spring, and spear the gig. If you don’t succeed the first time, try again – it takes a few times to get the ‘giggin’ down pat. 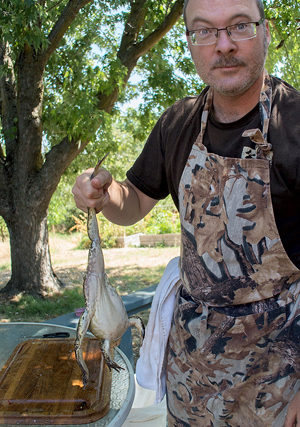 Angler, hunter, gardener and award winning author and chef Hank Shaw offers this delectable recipe on his site, Honest-Food.net – Thank you Hank! Sometimes, you find something too great to pass up! One look at this dish, and you know it’s a must eat. 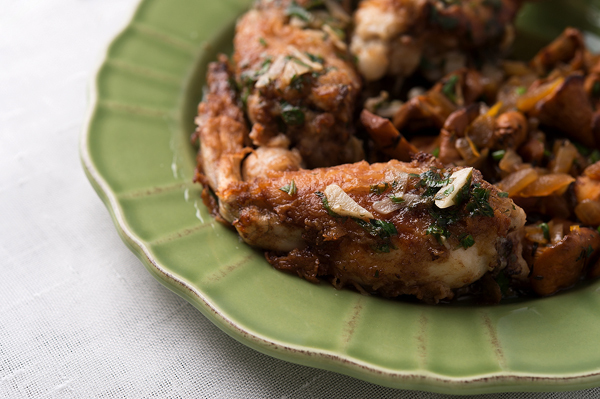 This recipe is classic Provencal, formally called, “cuisses de grenouille à la Provençale,” and it is the way Hank first experienced frog legs as a child. The memory stuck with him. Find his story and recipe here. It’s a great read with a delicious ending! A special thank you to author and ecologist Corinne Duncan for her content contributions to the Bullfrog Introduction. In a large wok or skillet, melt butter over medium-high heat. Add onions, bell peppers, and parsley, sautéing until onions are clear. 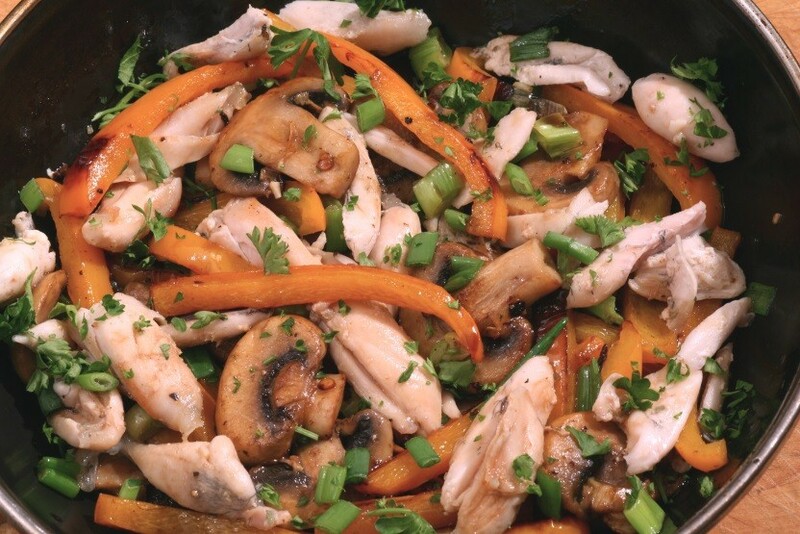 Add mushrooms, garlic, onion salt, and ginger; stir well and cook until mushrooms are hot. Add hot sauce and frog legs and stir well, then pour in the wine and teriyaki sauce. Reduce the heat to medium-low (250-300˚F) and simmer 10 minutes, stirring once or twice. Garnish with minced green onions, and serve with buttered grits and stewed tomatoes. In a bowl, add the egg whites, your favorite Cajun seasoning, cayenne pepper, lemon pepper, salt, Tabasco sauce, baking powder and beer together and thoroughly mix. Next, dissolve 2 tsp of cornstarch in a small amount of cold water and add it to the mixture. Again, blend all of the ingredients together. This will be used to coat the frog legs. Heat peanut oil (or other vegetable oil) to 365°F and fry the legs for about 3-4 minutes on each side (turning once), or until they have turned golden-brown. Do not attempt to fry too many at one time because it will bring down the oil temperature. This will make them greasy. We are looking for crispy legs, remember? This is why it is important to maintain an even temperature throughout the process.